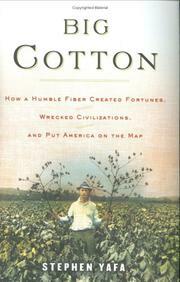 The story of cotton, from the beginnings to its place in modern geopolitics. Domesticated in both the Old and New Worlds, cotton’s comfort and versatility were obvious, but its labor-intensive cultivation and processing retarded its spread beyond its native regions. Yafa points out that the fiber came into fashion in Europe with the importing of Indian fabrics that combined comfort and colorful patterns. Soon after, the British seized India and acquired what was then the world’s main center of production. At the same time, cotton was becoming a staple of American agriculture, and it took on new importance with the mid-18th-century invention of machines to speed up its spinning and weaving. The spinning jenny, power loom, and cotton gin made it profitable, and the British industrial towns that were set up to exploit it set a pattern for other developing countries. In America, cotton towns were at first more benign than the British, and, eventually, mill workers’ opposition to southern slave labor led to the work being handed to immigrants. The end of slavery radically transformed the southern cotton industry, a trend accelerated by the arrival of the boll weevil, from Mexico, in the 1920s. The tale of cotton took another twist with the introduction of blue jeans, those work-clothes that became fashion statements for at least three generations. Once the focal point for the development of chemical pesticides, cotton now is on the cutting edge of genetic engineering and of nanotechnology. It is also a major cause for friction between the US, which subsidizes cotton farming in a major way, and the developing world, where farmers face a struggle to make a living wage in the face of US trade policy. Well-told, effectively documented survey of a major historical subject.